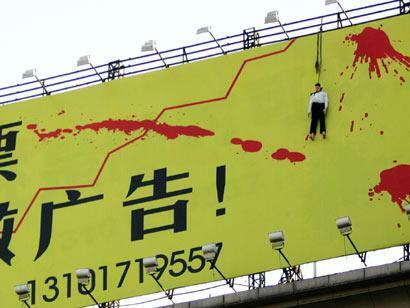 This billboard, featuring what appears to be a man hanging from a rope, has caused outrage in China. It’s been displayed on a mall and it says: “It’s better to invest money here than put it into the stock market.” The creative director behind the ad, said they are just “making fun of the depressing stock market”. @nateDAWG: you think bashin’ an annomoly named “flappycunt” is going to go somewhere… yet you dish out details of your own personal life and continue to bash random people here..the gloves are off now. U r a FAIL. Shock Marketing. No Awe though. What would happen if this had been an ad in the US. @outofocus: I feel like I missed something here. i would have still lol’d. if anyone knows anyone who did this, then, whoops. @TrikYodz: I would have definitely lol’d too. I can has baylout nao?